Colorful banners, puppets and hand-painted signs filled the streets of Washington, D.C. as an upbeat crowd of more than 200,000 made their way from from the Capitol Building up Pennsylvania Avenue to the White House, sending a strong message that climate change is a real and growing threat to local communities and the economy. 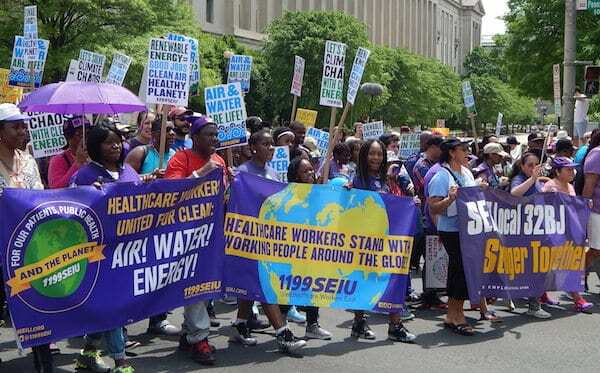 SEIU, the Service Employees International Union, is one of the more than fifty environmental, economic, labor and racial justice organizations that joined together to support the march. These included Our Revolution, Native Organizers Alliance, the NAACP, 350.org, Color of Change, Sierra Club, the Communications Workers of America, the American Federation of Teachers, and People’s Action. 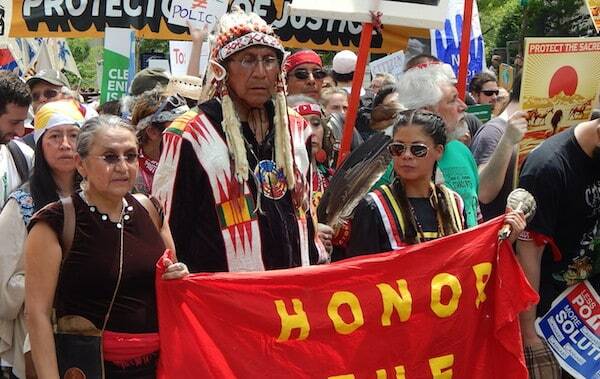 The march on Saturday, April 30th was led by a contingent from indigenous communities from Alaska to the Amazon. Native peoples often find themselves on the front lines of climate change, facing encroachment on their lands and rights by extractive industries and government agencies. “People are waking up to what we’ve been fighting for, for hundreds of years – to protect Mother Earth so all our grandchildren, great grandchildren and future generations can survive,” said Oliver Semans, who traveled from the Rosebud Sioux Indian Reservation in South Dakota to attend the march. Semans is an advisory board member of the Native Organizers Alliance. He and his wife Barb lead Four Directions Inc., a nonpartisan group in South Dakota that has promoted Native voter engagement across the country since 2002. He is concerned by the early executive orders President Trump has signed to restart construction of the Dakota Access Pipeline and the Keystone XL Pipeline, which had been stopped in 2015 by an alliance of Native and non-Native residents of the Midwest. The dramatic showdown last year between Energy Transfer Partners and American Indian water protectors over the Dakota Access Pipeline near the Standing Rock Sioux Reservation in North Dakota captured the imagination of the climate movement around the world and has revitalized it in the United States. It was no accident the climate protests – more than four hundred around the world – were held on the one hundredth day of the Trump presidency. While concerned about global climate change, participants are particularly alarmed by the environmental policies of the new administration. Just one day before Saturday’s march, Trump ordered the Interior Department to “reconsider” safety regulations on offshore drilling that were established in the wake of the Deepwater Horizon oil spill in the Gulf of Mexico. Trump’s agenda of dismantling environmental protects may be the most successful aspect of his first one hundred days. 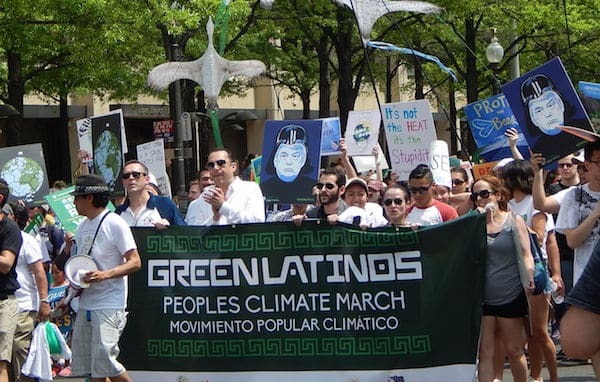 The People’s Climate March was called by the People’s Climate Movement, a coalition founded in the wake of the of the massive climate march held in New York City in 2014. The network brought together a broad range of organizations and movements around the goal of building a response to the urgent challenge of addressing climate change. The group organized protests in more than twenty states, in addition to the march on the White House. 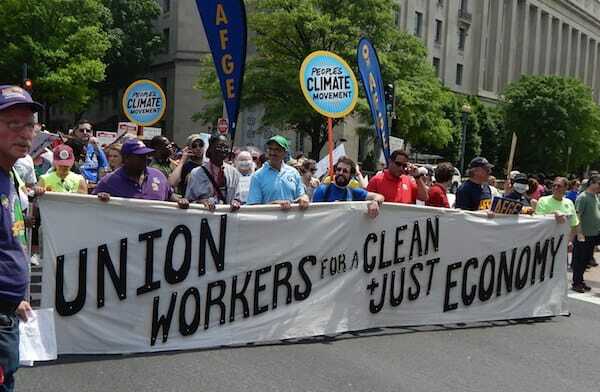 The movement’s platform calls for rapid reductions to greenhouse gases and toxic pollution and proactive measures to help communities and workers negatively affected by the shift away from fossil fuels towards sustainable energy sources, among other goals. The importance of protecting the country’s water, air and environment is increasingly embraced by millions of people in the U.S. across regions, racial differences and across the political spectrum. Even in coal-producing states like West Virginia, there is consensus between environmental groups and coal producers that there is a need to to trap carbon before it enters the atmosphere, to slow the pace of climate change. However, the Trump Administration’s seeming resolve to turn back the clock on both recent and long-standing environmental protections flies in the face of scientific consensus and popular sentiment. Construction of the Keystone XL Pipeline, which had been stopped in 2015, may resume construction in the wake Trump’s executive orders, which face challenges in court.